Public discontent with the draconian economic changes the Conservatives are introducing is rising . Dartmouth has a homecoming every year. Alumni scattered around the globe come back for the weekend to party. The highlights are a parade, a football game against another member of the Ivy League and a bonfire on the college green (we are known as the Big Green). The bonfire is built by the freshman class during the week preceding the festivities and is set alight on the Friday night, when, by tradition, they run around the fire as it burns to celebrate their arrival. The fire is stacked high and all and sundry wait for it to tumble. And the grounds crew works busily so all that is left by morning is a (non-wifi) hot spot on the ground. One year some (not so) bright spark in the administration decided that the creosote-soaked logs that had been used for the fire for decades were not environmentally friendly and shouldn't be allowed. That was the year the fire burnt like a damp squib and never did fall. That freshman class is known as the one whose fire didn't burn. Moral of tale: don't mess with stuff you don't understand. Which brings me to the sorry tale of another failed bonfire, that of the quangos. The House of Commons public administration select committee (PASC) has just published its analysis of that policy in a report called Smaller Government: Shrinking the Quango State. The report argues that "this review was poorly managed. There was no meaningful consultation, the tests the review used were not clearly defined and the Cabinet Office failed to establish a proper procedure for departments to follow . . . The current approach is not going to deliver significant cost savings or result in greater accountability." Ouch! Bernard Jenkin, Conservative MP and chairman of the PASC, says that in practice "very few" functions have been ended. "The whole process was rushed and poorly handled," he argues. "This was a fantastic opportunity to help build the 'big society' and save money at the same time, but it has been botched." The Conservative Party's manifesto stated that, "over the course of a parliament, we will . . . save a further £1bn a year from quango bureaucracy". Actual efficiency savings look closer to zero. The committee asked Gus O'Donnell, the cabinet secretary, to write to it with the latest estimates of the savings likely to be achieved by the review. Members noted (on page 30) that he was not able to give them an estimate, merely saying that public-body reform would "make a contribution" to the achievement of wider targets for administrative savings. Francis Maude, the minister responsible for this train wreck, blubbered in a radio interview that it was "hard to quantify" the precise economies that could be made, but said they would be "very significantly more" than the £1bn that David Cameron said could be saved. And the moon is made of blue cheese. Analysis of the government's plans by the Daily Telegraph showed that, of the 192 quangos being abolished, just 29 will disappear altogether. In an editorial, the Telegraph argued that "if the intention was to save money, improve accountability and reduce the size of the state, the cull has been so badly handled that none of these ambitions may be achieved . . . The legislation is poorly drafted and the hoped-for savings are unlikely to materialise." The government is quickly gaining a repu­tation for lack of effective planning, broken promises and obfuscation. Recall the mess Michael Gove has made so far of his education brief. And incredibly, on 4 January, the day that VAT went up to 20 per cent, George Osborne claimed that the increase was "progressive". That brings me to another potential banana skin. Cameron has announced his desire to create a national well-being or happiness measure, backing it with a couple of million quid. Jolly good idea, but maybe you should have thought through what it is likely to show, Dave. Timing is everything in economic policymaking. Why bother measuring happiness? Economic policymakers concern themselves with macroeconomic variables such as inflation, growth, unemployment and the deficit. But these are "intermediate goods", because they don't matter in themselves. What does matter is how they affect people's living standards and wellbeing. One way to work this out is to ask people directly about their levels of happiness. The data in the table above, taken from a newly published paper of mine (D G Blanchflower and A J Oswald, International Happiness, NBER working paper #16668, January 2011), is illustrative. The figures represent responses to the question: "On the whole how satisfied are you with the life you lead?" Very satisfied =4, fairly satisfied =3, not very satisfied =2 and not at all satisfied =1. So, if everyone said they were not at all satisfied the mean score would be one - and the higher the score, the happier. The French and the Germans are less happy than we are. The Danes are famously happy, while the southern Europeans are miserable. 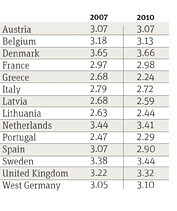 The table shows that happiness rose sharply in the UK under the Labour government between 2007 and May 2010, from 3.22 to 3.32, while it collapsed in Greece, Latvia, Lithuania, Spain and Portugal, countries that have implemented draconian fiscal austerity measures. In part, the rise in the UK is likely because falling "tracker" as opposed to fixed-rate mortgage payments have helped to protect households from the crisis. All of this is likely to change as real wages and incomes fall and job insecurity and unemployment increase, especially when interest rates rise. The evidence from the happiness literature is that income buys happiness, while unemployment lowers it. It is hard to see how austerity could possibly raise happiness. Don't mess with stuff you don't understand.